Add an array of eye-catching flowers to your spring-themed paper crafts with the exclusive Nested Spring Flowers Decorative Die Set by Scrapbook.com! 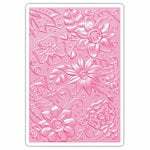 These wafer-thin metal dies cut cleanly through paper, cardstock, vellum, foil, fabric and other thin materials and add detailed design to your paper craft projects when you stack and layer them on your cards, pages or tags. Included are flower shaped dies in a variety of sizes that you will find a multitude of uses for; they’re a must-have if you love creating with dies. You will enjoy that they will work perfectly for your blooming small projects right up to your full-bloom larger ones; you’ll appreciate the versatility of this set! Get ready to add detailed layered or framed designs to your DIY crafts with this affordable set; you won’t believe how awesome your projects will look with the floral design. 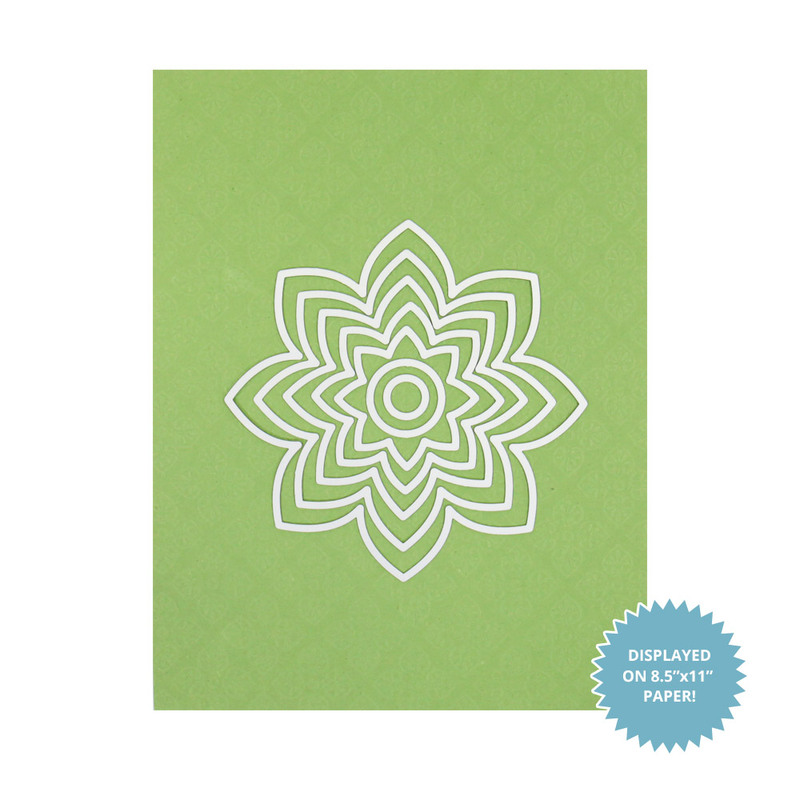 If you love the spring flower dies, you’re going to want to check out all the other nested shapes that are available at Scrapbook.com. Lesson learned: Always read description! 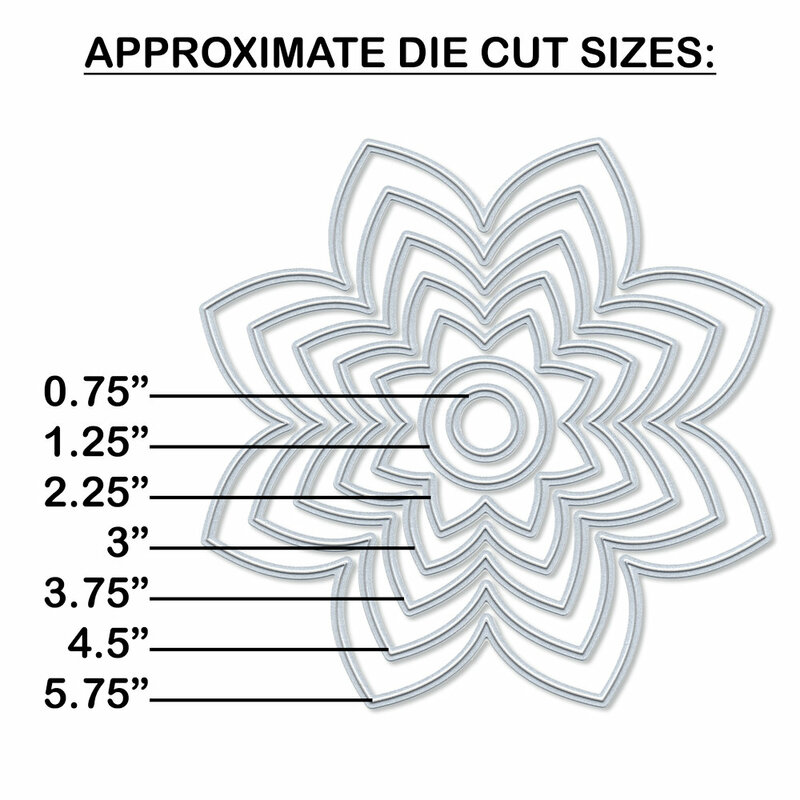 Scrapbook includes die size or size range for each die or die set. I thought I recognized this one from a card I received, so I ordered it without checking description. Largest flower size is 6"x6"! I doubt that I'll ever use it, but at least three smallest sizes will work. I didn't deduct a star for my negligence, although I should begin to deduct a star for any die that is secured by adhesive. Adhesives are my pet peeves about dies. First the dies have to be pried from the adhesive - not an easy task - and then adhesive traces have to be removed from the backs of dies before they can be used. This is a great product. I use them to cut fabric for decorative flowers on assorted projects. Fronts of baby girl bibs, decorations on bags and purses and quilts. They cut fabric as easily as card stock. The uses are only limited by the imagination! I received my die cut just a vweek ago, and I,ve already started to mak a felt runner for my table. This product has turned out to be a time saver as well as a product I’m finding out I will be reaching for many times in my creative projects. Beautiful! I can't wait to use them. Love the lily pad idea!! This set of nested flower dies is much larger than I expected. I think I will probably only use the smaller 3 or 4 of them. I make A 2 Cards and most would not fit on a card. These dies are good quality, and love the star flower shape. But they are a bit large, the two larger dies are too big for an A2 size card. They work well with other flower dies and stamps that are in my collection. I look forward to using them in decorative items as well. Love this set. Used as soon as I received it. Making table decorations for a 60th birthday party. So glad I saw this. Love them and easy to use. Love it, but didn't realize how big it is :o) I am really looking forward to trying it out. Is this compatible with Sizzix Big Shot? By: mcalli (10-Jul-18) Helpful Question? Yes | No Thank you! Report Inappropriate This question has been reported. Thank you! it absolutely is, we also have a bundle option available: https://www.scrapbook.com/store/sbc-bigshotbundlespringflowers.html By: Jessica_ (11-Jul-18) Helpful Answer? Yes | No Thank you! Report Inappropriate This Answer has been reported. Thank you!